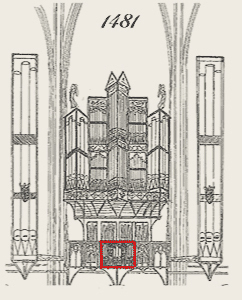 In 1353, Our Lady of Chartres already has an organ : Jehan de Chateaudun figures as cathedral organist. 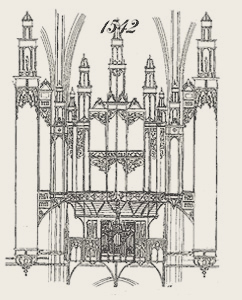 He plays an instrument installed on the tribune with double arch wood paneled, still visible today, clinging to the second bay of the southern wall. 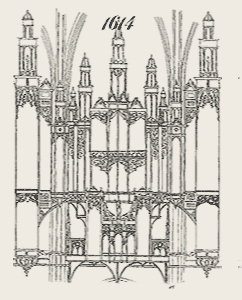 In 1475, the clergy wants to see built in the same place an organ as powerful as that of the Cathedral of Poitiers. Gombault Rogerie, brother Preacher of Pons, in Saintonge, installs an instrument making talk up to 50 pipes per key : it is a great Blockwerk. The large rectangular towers pedal each receive three pipes by tower. 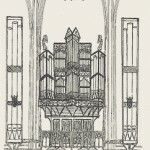 In 1542, the chapter entrusts to Robert Filleul, organist, the task of building a new organ after the previous disassembly. The large keyboard then includes a large plein jeu of 25 ranks with separate register. The choir manual activates a horn. It can be coupled to the larger keyboard. 4 pipes of 24 feet occupy each pedal tower. All joinery is entrusted to Roulland Foubert and Jacques Beley, chartrains carpenters. They will decorate the work of numerous line-engraving worked foliages, heads in round-bump, masks, foliages, two bottoms of lamps in the big towers, crowning a group of lanterns who remind Chambord. Much of this work still exists. Filleul signs his work at the top of the west tower in 1546. The validation of this work is received in 1551. Roch Argillières rebuilt the cornet of choir’s keyboard in 1581. In 1614 Crespin Carlier, famous factor that completes a new organ at the Cathedral of Poitiers, organ preceding the current Clicquot, makes for important works which we have no written record. 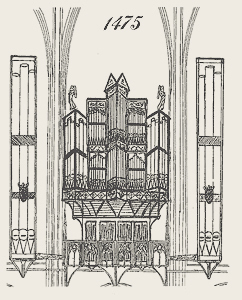 It is probably on this occasion that the great towers are divided into two levels, and the choir Keyboard is enriched with two large flat-sided. 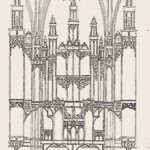 The composition should resemble that of Jean Titelouze’s organ in Rouen. In 1647 Robert Gouet adds (among others) an echo cornet, a cromorne and a human voice. The buffet is not modified, but the soubd composition is gradually changing. 13 stops are on choir and 3 at the pedal. Jehan de Héman and Pierre Désenclos complement works in 1649. A fourth keyboard (swell) seems to be added by Stephen Enoch 1668. Henri Lesclop involved, and makes a commitment to burn and publish an organ book of Gilles Jullien organist from 1663 to 1703. Lesclop transforms the wind chests with boursettes, in “register coullans” whose maintenance is better and cheaper. 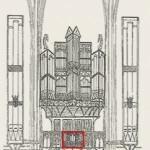 Jean Renault in 1744, and Adrien Lépine (student of Don Bedos) in 1780, are also involved in the great organ. In 1826, the bad condition of the instrument brings a think for its restoration and its displacement in background nef. 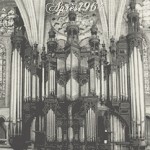 The fire of the cathedral’s roof in 1836 will interrupt the talks : the organ is silent durang a decade. 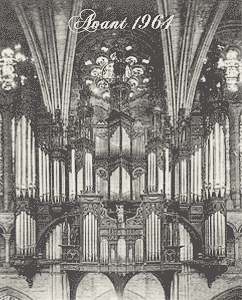 By lack of sufficient money to meet the different estimates of Parisian factors, it’s asked to Charles Gadault (father), author of the organ in St Aignan in 1842, to restore the instrument. The organ remains two full keyboards (Choir and Great organ) and two half-keyboards (Swell and Echo). The organ builder began work in 1844 but died soon after. The workshop will finish work very late, and the work shows many flaws. Charles Gadault (son) again work in 1865 without giving satisfaction. The swell keyboard switches to 42 notes at the request of the organist Edward Becker. Auguste Deceunynk in 1868, Aristide Cavaillé-Coll in 1868, and John Abbey in 1881 work on the mechanics and the blowe. In 1899, the deplorable condition of the instrument is known to all, religious and civil. In 1911, Joseph Gutschenritter made important works on mechanics and harmony. Some acute stops are removed in favor of more grave stops. In 1950, Jean Lapresté, commissioned by the Committee on Organs, provides a report on the condition of the instrument and concludes the need for very important work. 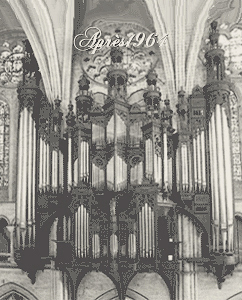 In 1952, Marcel Dupré ensures a recital on an organ of 36 stops in poor condition. The organist Victor Ruello trying to make the best of a flawed instrument, that Gouault’s brothers maintain the best with resources allocated until the renovation in 1971. 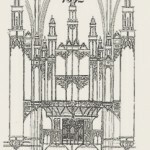 Pierre Firmin-Didot, a Paris publisher, founds an association for the renovation of the great organ in 1964. From different projects, it will be that of Georges Danion, director of the Gonzalez firm that will be retained and built : three keyboards and 57 stops are offered. A fourth keybord with 10 stops will be added on top of the organ by the action of the association founded by Pierre Firmin Didot. A neoclassical organ with electro-pneumatic transmission of 4 keyboards and 67 stops is installed in the buffet. Pipes are distributed throughout all the space of the organ. 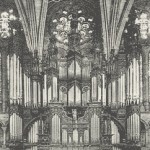 The towers have 5 pipes of 24 feet, bass and treble are placed in the triforium, and Soubasse behind the keyboards console. Keyboards of Great Organ and Choir, are with bunk’s wind chests, as the Swell. It is this instrument that we hear today. Several redesign projects have been developed but their achievements have been postponed indefinitely. The organ is regularly maintained to cope with the intense worship and cultural activity: the Insignia Basilique Notre-Dame de Chartres is a place of many pilgrimages, parish church and place of diocesan gatherings. The Association des grandes orgues de Chartres has supported the International Festival and the biennial international competition “Grand Prix de Chartres” world famous and faithfully followed, supported by the city of Chartres, the department of Eure-et-Loir , the Regional Council and the DRAC.